The larger ships, over 620 feet, dock at MITT Wharf at Thilawa Port, a distance of 15 miles (one-hour drive or more, depending on traffic) from the Yangon city center. Taxis are generally available at the port entrance. It is advisable to establish the fare before leaving the port. There is normally a free shuttle bus to the port entrance, where you can find taxis or meet a pre-arranged independent tour. There are no facilities at the port. 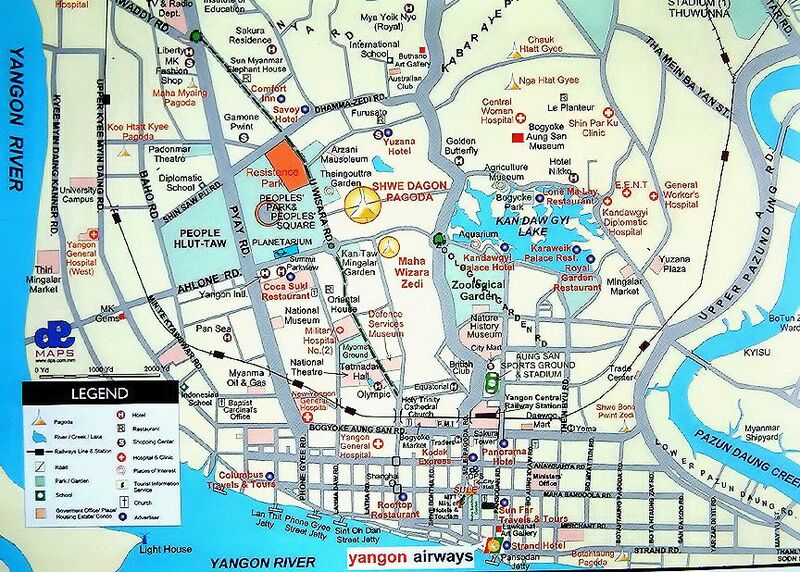 Yangon was the new name of Rangoon, given by military junta in 1989. as "Burma" became "Myanmar". After suffering decades of neglect, Yangon has begun to awaken. Efforts are being made to restore some of the vanished grandeur. One of the best examples is the city's famous landmark, the Strand Hotel, which has been reopened in its entire original splendor. Some of the buildings are reminiscent of the British colonial era. The Schwedegon Pagoda is one of the wonders of the World, and not to be missed. The pagoda is famous for the silver Buddha in the inner chamber weighing 1,105 pounds. Botataung Pagoda Clearing away the rubble after the bombings in World War II, a miniature gold stupa was revealed that contained Buddha relics enshrined here 20 centuries ago. An exact replica was built to hold this venerable treasure. The courtyard contains a Buddha image brought from Mandalay by the British. Please Note: Dress Code for Burma Religious sites in Myanmar have to be entered barefoot. Moderate dress is required to visit most sites, which means shoulders and knees should be covered for men and women. Taxis in general old models but inexpensive and do not have meters. Negociate! Price is about $70 for a full day tour. Cruise organized excursions all have police escorts. Two police officers on motorbikes will clear the traffic all the way into the heart of the city, making for a faster trip than a taxi. Myanmar is well known for quality craft items, in particular lacquer ware, colorful Shan tribe shoulder bags and puppets in traditional and elaborate costume. The best and largest selection of handicrafts can be found at the Bogyoke (or Scott) Market in Yangon. Souvenir items can also be found in shops around the Thilawa Port area. Gems, jewelry and silverware are only allowed to be taken out of Myanmar if purchased in state-owned shops. Export of antiques is prohibited without permission. Beware of fake gems sold at many tourist sites. The prices are already inexpensive and the people really need the income from their sales, so if you bargain, do it gently. Food sanitation is often not up to western standards. Drink only bottled water. The local currency is the kyat. It may not be imported or exported. It is illegal to change money on the street or to make purchases in foreign currencies other than in government shops. The only safely factor to be concerned about is entirely in your control. DON'T TALK ABOUT FORBIDDEN SUBJECTS, or use the internet or ask to use someone's cell phone.